Last month I came across a green smear on one of the pages in one of the many magazines I love to page through. It looked interesting and after finding the name of the mask I googled it. Now the mask in the picture is not the mask I googled but it is in the same range. There are multiple masks in the range for different problems and I picked up three of which this one seemed the most interesting. I have taken a picture from the internet so that you can see the packaging better. I took my pictures at night and they are a little bit dark. Let us start with the the packaging. I think next time I use this type of mask I will not tear it from side to side. The problem was that I created a huge mess. Next time and I recommend this, if you are thinking of trying this mask, to create a small opening across one of the corners. This will allow you to control the amount of product you want to use at a time. The application of the mask was messy because of my rookie mistake and I also think it came down to the fact that this is a very runny type of consistency. Maybe next time I will try using a flat foundation brush when applying this mask. 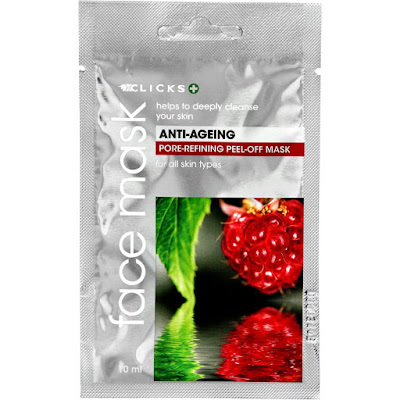 When I was busy applying the mask it had a strong and pleasant smell of raspberries and it felt cool on the face. The smell lingered most of the time it was on my face but I found the smell to remind me is yummy jelly sweeties. It might be that I applied too much of the product ( I used all of the contents) but it took some time to dry down, to be able to make it a "peel off" mask. It only started drying after 10 mins and it is only suppose to be applied for 15 mins. I had it on closer to 25 mins. When the mask dries down, it start to feel like it is lifting. This is how you know you can start to peel it off. When I applied it at first it had a cooling effect but afterwards my skin felt warm to the touch. I did not experience extreme dryness afterwards, but I could definitely feel a change in my skin a couples days later. More the problem areas than the whole face. I did however experienced more redness than usual the following morning. At the moment I have a very dehydrated skin and although I have enjoyed using this mask I will however be focusing more on hydration rather than what this mask is for. I felt it emphasized the dryness in my skin but other than that I feel that the experience was a pleasant one and I would like to re-try this one day. If you have used this mask before please let me know what you thought of it in the comments below.